Mobile working is happening in increasing numbers of businesses. The prize is enormous for businesses who get mobile working right in terms of productivity improvements and happier employees. However recent research carried out on behalf of TeleWare highlight several challenges employers and employees face with increasingly mobile workforces. So, why aren’t more businesses and employees getting more benefits out of mobile working? Join our panel discussion to find out more about these insights and toget all your questions answered live on how to overcome these challenges. • Is GDPR holding you back unnecessarily? As well as sharing exclusive content, there will be opportunities to ask our expert panellists about any burning issues around mobile working beforehand or during the webinar. So, if there is anything you would like to cover, please get in touch. ... and the technologies that will prevent it. Join this webinar to hear how technology is creating a mobility-enabled workforce to increase productivity in financial services and the lessons other sectors can learn. Creating a modern workforce that has access to the technology that will improve productivity is key to ending the productivity crisis. TeleWare, working with Financial Services clients are helping create a mobile-enabled workforce designed to improve productivity. These lessons can be adopted in many vertical sectors, particularly in a post-GDPR and Brexit world. Join us for this insightful webinar that explores the technologies firms are adopting to help increase productivity and to beat their competition. Could millennials be the key to ending the productivity crisis? By 2025, it is estimated that 75% of the workforce will be millennials. With rapidly changing expectations on how, when and where employees want to work, technology is going to play an increasingly important role in attracting and retaining talent. Employee expectations to technology are changing rapidly. In their personal lives they often use the very latest technology, but often that can be difficult for firms to replicate. So, BYOD is becoming increasingly attractive for many employees who would like to use the technology they know and love for business as well as pleasure. Join our panel of experts who will explore how BYOD strategies are evolving and how Re:Call from TeleWare could be the secret weapon you didn’t know you needed. Just 29% of UK employees work for firms that operate flexible working policies for all employees according to recent research commissioned by TeleWare. This highlights the stark differences in how firms are creating workforces who can work flexibly in an increasingly mobile environment. One thing is certain, tools that enable employees to work wherever and whenever they want to are here to stay, but how firms deploy them could be the difference between success or failure. 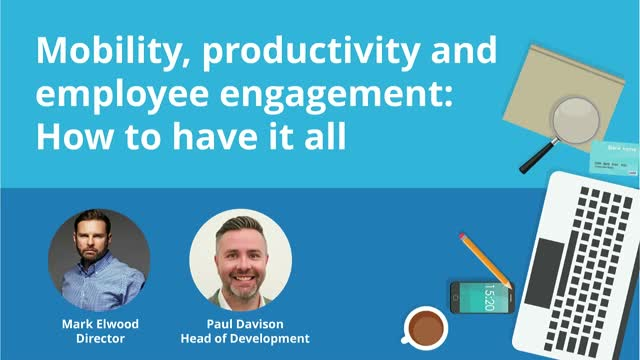 Join us in the latest webinar in our mobility and productivity programme where we will share exclusive insight into mobile and flexible working practices. •The barriers to successful adoption and how you can overcome them. Check out our highlights video from Future Decoded 2018 to see what we got up to (you might have even made the final cut! ).